Geese are friends to no one, they bad mouth everybody and everything. But they are companionable once you get used to their ingratitude and false accusations. Arguably the number one rule when photographing waterfowl is too get low, yes this may cause a sore neck, you may get a little muddy and wet. But once you are home and dry scrolling through those cracking shots you’ve captured all those thoughts of pain & cold are long forgotten. Too many times have I seen photographers with a long lens mounted on a tripod, towering over a subject. Yes we see the world from roughly 5-6 feet, but birds do not. To connect with the subject you really need to ditch the tripod and shoot from the birds perspective and not ours. All of the images in this blog are shot with the camera resting on the ground ensuring I am as low as possible to the ground when shooting. When you look out the window and see the rain hitting the window. Don't crawl back under the duvet embrace the conditions. Throw on your waterproofs and head out bad weather will always add an interesting dimension to any image. When photography in rain, you are faced with a number of problems. Firstly how do you keep your expensive kit dry & safe. I'd highly recommend the covers from Wildlife Watching Supplies. I find they offer the best protection and have never let me down. Working locally is a topic that I am constantly banging on about on my Instagram feed. Yes, I know there is the constant pull of wild and exotic places. But by working locally at the same spot for an extended period you are able to build up a local knowledge of the best spots, learn how the light will fall at any given time of year and perhaps the biggest advantage is living close to the site so you are ready to react as soon as the perfect conditions materialise. To many people get caught up in photographing big exotic subjects yes it's great to have a roaring lion or a brown bear running down the barrel of the lens. But just because it is an impressive subject doesn't equate to it being a great image. 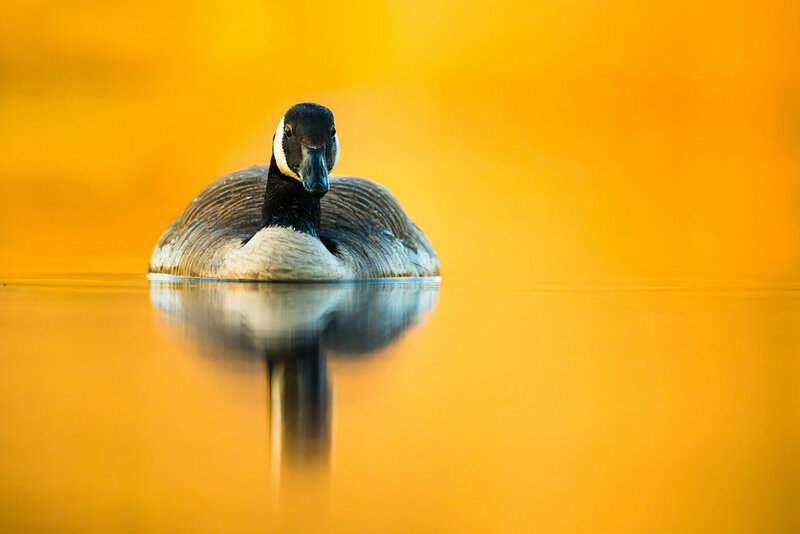 I would be much happier photographing a Canada goose in beautiful light than a big trophy species in flat light. At the end of the day it's not the subject that matters it's the final image. Throughout this blog I have tried to show that award winning images can be taken 5 minutes from your house. So grab your camera head down to your local pond and let me know what you can produce..